Soon after the introduction of the Apple Macintosh, PCs and desktop publishing software, efforts began to help users to manage and control how colors were reproduced in print and publishing workflows. We’re talking about the mid-1990s, and it’s probably fair to say it took some ten years to get modern color management and the use of ICC-profiles to work properly. But since about 2000, all the important tools have been in place to manage colors, both on screen (on your monitor), in the camera, on the color printer – and on press. And yet it seems that this knowledge hasn’t been fully imparted to those who need it: designers and photographers. No longer is the artwork, which is the basis for final prints, prepared by specialists at a repro house or in the printer’s prepress studio. Designers and layout operators at an ad agency or working as freelancers for a string of clients have undertaken the role of preparing and clearing the artwork before sending it off for print. But still too often a deeper knowledge of applied color management is either missing, or a bit shaky, to say the least. Color management is looked upon as some kind of strange black magic that only a few wizards seem to be able to cope with. This perception is unfortunate, because color management is today a well-established and practical science. It is entirely possible, albeit not always very simple, to understand and apply. The benefits of mastering basic color management are clear. At the very least, you will be able to see the final colors on screen before you send off the artwork to be printed. Any mismatch later on regarding proofs or sample prints can be dealt with early in the process, so inferior or unexpected prints should never happen. In other words, applying proper color management in the design stage is a sound measure and a means of applying serious quality control. Doing so will save your time and money day to day, and will remove a lot of guesswork and hassle, not to mention stress, from your daily work. If we start with the images, it’s important to decide at the start what color space in RGB you would prefer the images to be saved in. The most common choices are sRGB and Adobe RGB. While many consumer cameras save the images in sRGB, this is actually a quite small color space, so it is not suitable for high end print production. The misconception has spread that sRGB is the best standard RGB color space because so many consumer photo print systems are set up to receive and print from sRGB. A far better choice is Adobe RGB, since it has a larger colour gamut. This means it can describe more colors and so will allow you to get the most out of your photos, regardless of the printing process you choose. Many large format printers have a gamut that is actually much larger than that of conventional offset. Printers we have tested from HP, EFI and Mimaki can actually have as much as double the gamut, so it is a waste of quality to reduce the available gamut to that of sRGB. Many photographers use Camera RAW to capture the maximum gamut and image depth possible with a professional, high end digital SLR camera. But after processing the image, applying retouch and editing the image, it has then to be saved in a file format and gamut that can be used in the print and publishing workflow. Typically, this will be as Adobe RGB. Your next step is to view the images and artwork on a color calibrated monitor. 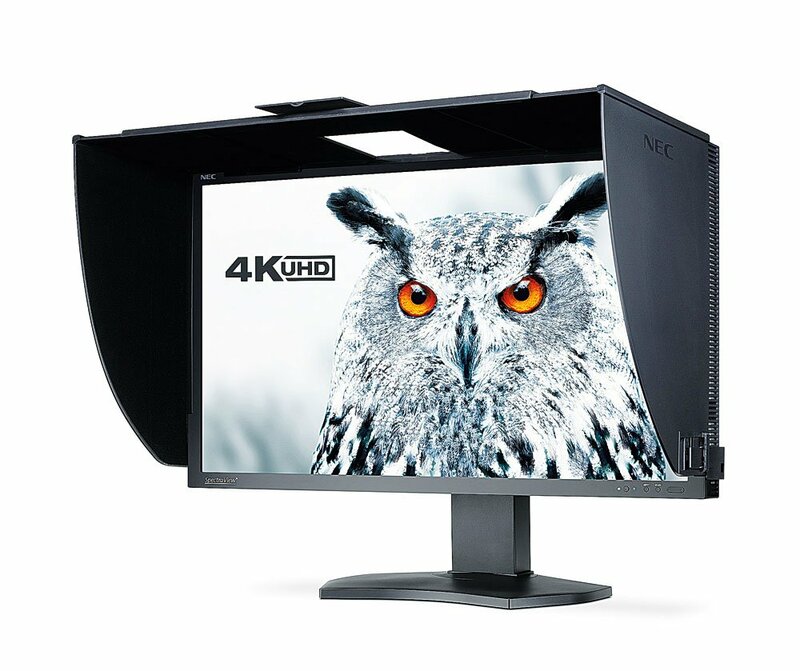 Most of the high-end monitors today can reproduce the gamut of Adobe RGB. This also means they can simulate the colors in print, since most printing processes have a smaller color gamut than that of Adobe RGB. The Adobe Creative suite can be set to simulate the perceived colors of the final prints on screen. You just apply the ICC profile suitable for the print process, or printing device, of your choice. If you are not sure what ICC profile to use, just ask your contracted printer – probably their prepress manager will be the one who helps you here – and activate the correct ICC profile in InDesign, Photoshop, Illustrator and Acrobat. From now on the artwork will be color managed. Even spot colors will be correctly rendered on your monitor, at least 90-95% of them, depending on the quality of your monitor, and how carefully you have calibrated it. The next step is to produce color proofs of your artwork to get approval both for content and color accuracy – and here we have the really good news. Since the introduction of color printers using seven or more inks in the ink setup, some 98% of spot colors can be correctly reproduced with an inkjet printer. By using the standard process colors, CMYK plus additional extended colors, typically Orange, Green and Violet, the gamut in such a color printer can achieve a gamut very close to that of Adobe RGB. Violà! You can see accurate colors on your high quality monitor, and you can proof them on a high quality printer. Goodbye to guesswork and anxiety regarding the final colors in print. You can now focus on the creative side of the design and artwork production, and know that the colors you see on screen will also be printed in a color-accurate way. You don’t have to be a practitioner of black magic to achieve this. And you don’t need to have a degree in color science. The tools are all there for you to apply. The software is ready, all you need is a good monitor and a calibration device, typically a colorimeter. But none of these are particularly expensive and you will save much more in time savings and shortened lead times, as well as, it improves quality. Find a good consultant or technology provider to help you establish this. And only work with wide format digital printing companies that have a proven track record, and know how to print according to standards. Ideally they should even have a certificate that proves it.